Cycle counts are a tool you can use to detect shrinkage and prevent lost revenue. It's no secret that the most controllable expense you have in retail is your inventory. 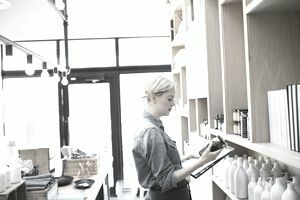 While poor management of your merchandising plan through not tracking inventory metrics like GMROI or turnover are huge contributors, the biggest single contributor to a loss in inventory is shrinkage. Inventory shrinkage refers to the amount of inventory lost in the course of doing business. This could be from theft, receiving errors, entering the wrong SKU in the POS or even improper handling of a refund or exchange. With so many ways to "lose" inventory, you can see why it is such an important component of your operation. We often find a ton of money lost by them from poorly managing their inventory. The best way to check is through a physical count. However, a physical count of the entire store is quite the arduous process. And it's why most retailers only do one per year at their fiscal year end. Other retailers will do two per year, but statistics show that the losses (shrinkage) tend to be about the same. Meaning that if you only did one inventory a year and had a $20,000 loss (shrink) and did two inventories a year, you still will probably end up around the same loss if you were not on top of your inventory management, to begin with. You might think it futile to do more than one physical count of your inventory per year, but that is not the point at all. Doing more than one count will improve accuracy and flush out bad inventory practices before they cost you too much — especially if the shrinkage is due to theft. The thief will steal the whole year versus just part of it before being caught. The issue is time and cost to do a complete physical inventory. So what can a retailer do? The answer is to do cycle counts. Cycle counts refer to the process of counting a portion of your inventory each month (cycle.) In shoe stores, in May we count all of the athletic shoes. We fix any errors in the POS which helps ensure we do not run out of stock on a product. In March we count all the sandals and so on. As an example, one of the big drivers of lost revenue is poor management of fill-ins. This refers to the computer reminding you to "fill-in" on a certain product based on sell-thru rate. If the inventory count is off and the POS thinks you have four of an item when you only have two, then it will not trigger a reorder. You will end up with an empty shelf and lost revenue from the customer who came in to buy that product. The customer leaves and goes somewhere else to buy. Since they could find it there, they will go back to your competitor's store from now on. A cycle count can prevent this from happening by finding the error and fixing it. We're sure all of us have experienced shopping with a retailer who said they had "two in stock" but cannot find either of them. Through practicing a process of cycle counting, you reduce the errors (hopefully) and better manage your inventory. Only count one category each month. This allows you to hit everything more than once per year. It also keeps you focused. And, frankly, it's the amount of inventory you can handle in this type of count. Cycle counts should never close the store. In other words, you should be able to complete the count during normal business hours or maybe within a couple of hours after close. Pick which category to count based on selling season. For example, there is no need to count long sleeve shirts in July. Count your shorts in July. The idea of cycle counting is to be able to respond before the season ends. In other words, fix the errors on products that are selling now. While it does make sense to cycle count for planning purposes for the Fall, the real benefit will come when you can respond immediately while the products selling opportunity is at its peak. Assign a section of the store to an employee. Make one person accountable for an area. They keep it maintained and cleaned and merchandised. That person completes the cycle count. It was included in the employee's performance review each season. Note: We always had a manager help with all counting as part of a check and balance system. You don't want the person mismanaging or worse stealing your inventory to be in charge of counting it. Post results for employees. While you don't need to share all the exact dollars with your employees it helps for them to know how they are doing. If there is a loss, they should know. Often, it is the employee who can help you stop the leak and keep your inventory from shrinking. We can name several times it was an employee who solved the mystery, not me when it came to inventory issues. Don't publish your count plan schedule. Keep the employees guessing. While we suggested picking the category based on seasonality, you don't want to be too predictable. Again.the internal thief will find the practice of knowing what you're counting very beneficial for his or her planning as well. The key to cycle counting is that it is habitual, but not overbearing. We have seen retailers try to do too much each month and essentially just conducted mini inventories each time. That is not the point here. Keep it simple and it will serve you well.